Left over with murukku or do not have time to prepare paruppu usli during a busy working day but have craving for it? You have come to the right post!!. 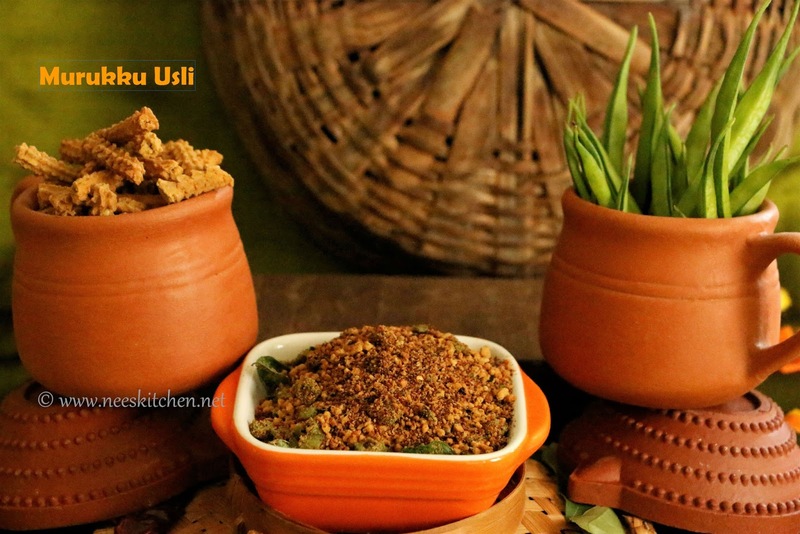 Try this quick & easy murukku usli which tastes equally good. Murukku is not just made during festival time. We also make/buy to munch during weekends. At times, we do not finish all of them and when the weekday begins it lies on the dining table and finally we land up throwing. Rather than wasting or eating them all by myself, it is better use it in a way that all of us can share this leftover and that is how Murukku Usli came into my mind. I have already shared Murukku Chat which is also made using left over murukku. 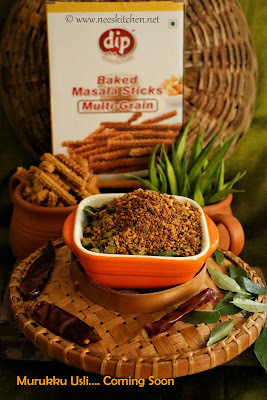 Murukku (Both non-crispy & Crispy) are combined with roasted chili, curry leaves and hing and made into a coarse powder. The mix is them combined with a vegetable of choice and cooked for few minutes. The dish will be ready in less than 10 minutes. Though it is a slight variation (in terms of taste) from the regular paruppu usli it was a super hit at my home. 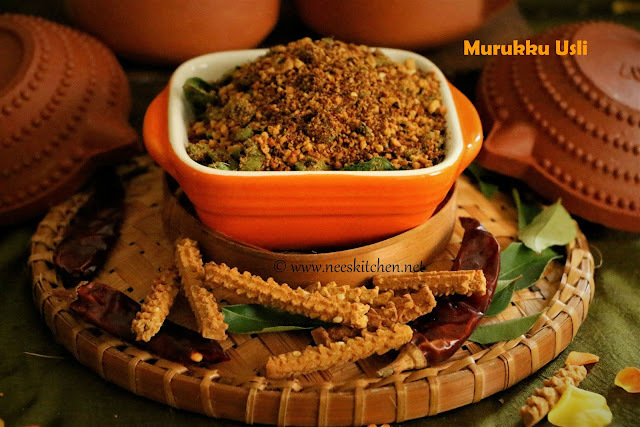 I started preparing this recipe from various murukku varieties and felt that the traditional south indian kai murukku, mullu murukku or those made with besan flour tastes the best. 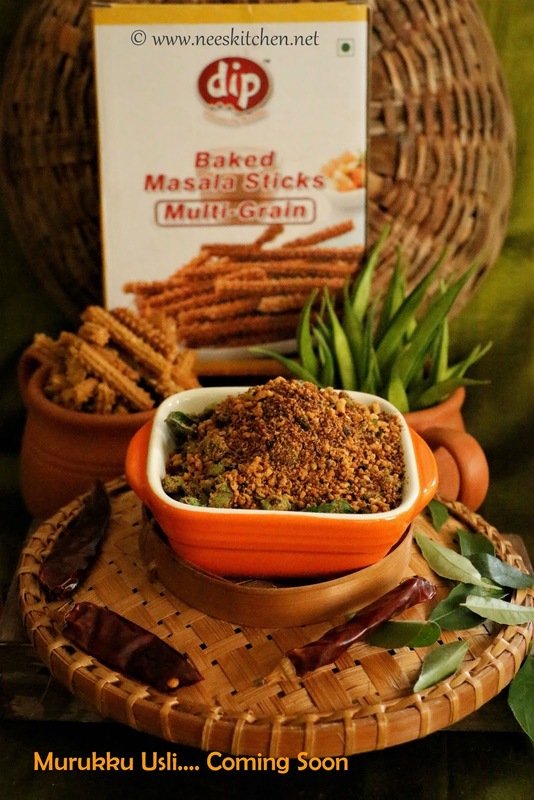 I used DIP Food’s Masala Murukku for the video. They are baked and hence less oil when compared to the regular one and I was happy for it. 2. Take a mixie and add murukku, dry roasted chili & curry leaves, hing. 4. Take a pan and add 1 tsp Oil. 6. Add the cluster beans and some more curry leaves. 7. Fry and cook them well. 8. Towards the end add the ground murukku mix. 9. Mix them well and cook for a minute. 2. Try to use less oil as murukku itself at times will have some oil. 3. You can use the murukku which is not crispy also for this dish. In that case towards the end, fry for additional 1 or 2 minutes. 4. Traditional South Indian Kai Murukku or mullu murukku tastes the best.